I wasn't there in 1967 -- I wasn't even born yet -- but it's still hard to believe that the Summer of Love was 40 years ago. What a long, strange trip it's been. 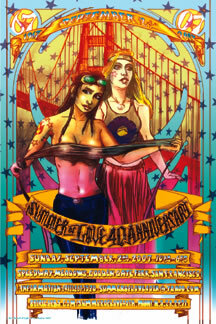 Check out "Summer of Love Radio" to get yourself in the mood for the 40th Anniversary this Sunday in Golden Gate Park. Scheduled performers include: Canned Heat, Country Joe McDonald, Taj Mahal, Moby Grape and New Riders Of The Purple Sage, among others. If you can't make it out to Golden Gate Park this Sunday, performances will be streamed on the web.